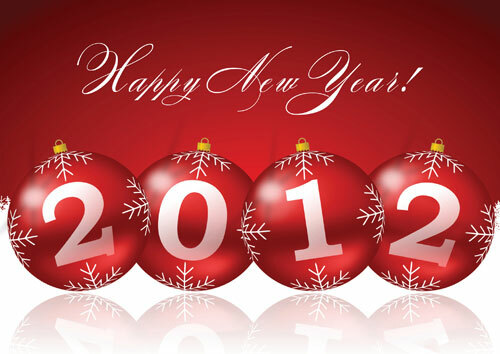 Wishing you all a happy and blessed New Year!! I still can't believe the year is over and it's 2012 already...Wow! Where did the time go? Thank you all for your visits to my blog over the past year! I appreciate each one of you. Do you have any New Year's resolutions? I sure do...one would be to not eat so much sugar...=o Another resolution would be to improve my blog. I am going work on posting more often and taking my blog more serious. I will have alot to show you over the next year, so I hope you will stick with me! I have a feeling this is going to be a great year!!!! It's time to share your creations! I'm looking forward to seeing what you have to share after Christmas. Are you putting your decorations up yet? I leave mine up until after New Year's. I sure wish I could snap my fingers and everything would be put away and things would be back to normal. Unfortunately that's not going to happen...darn! 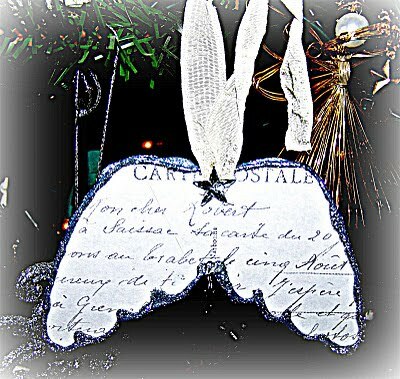 Trisha at Glass Slippers and all sort of suff created this pretty angel wing ornament. This could actually go right into Valentine's day. 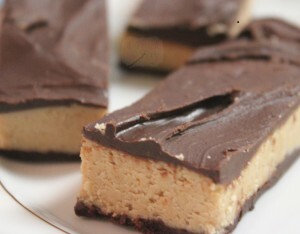 You can find the recipe to these tasty looking peanut butter bars at A Pinch Of Joy. 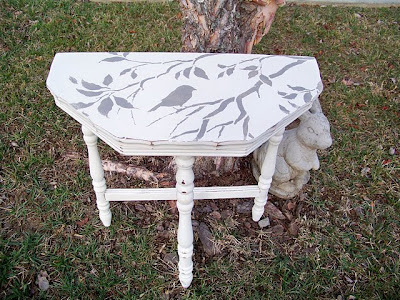 LOVE this table created by Penny at Flea Market Makeovers...so pretty!! Rhonda at Rambling's of a Southern Girl created a beautiful purple and silver tree for her salon. If I lived close I would definitely get my hair done there. Looks like a beautiful salon! Here are a few rooster arrangements I just listed in my Etsy store. I kept forgetting to take pictures but luckily Kevin took a few. Here's Chase after opening up his Ipod. He was so excited...that was the main thing he wanted. Here's me...I don't know what I was doing with my hand on my stomach. Probably trying to push my belly in from all of the food I ate! lol...I could have dressed up a little more, but I was in a hurry to get ready. Here's my mom holding up the jacket I bought her. That color is really good on her. I love this picture! My dad bought Sassy Cheez-its for Christmas...they are her favorite treats! Every time my mom and dad come over she will not stop barking at them until they give her Cheez-its. I think she's a little spoiled! I wish I had more pictures to show you. I didn't even get any of my brother or grandma! Shame on me! We have another Christmas next weekend with my dad's side of the family. I still have more presents to buy...so I will be out shopping again tomorrow. I thought I would wait until the after Christmas sales. I still can't believe Christmas is over! After next weekend I will be ready to get things back to normal. I will also be listing new Etsy store items this week and next. I am anxious to get started on some new everyday items. 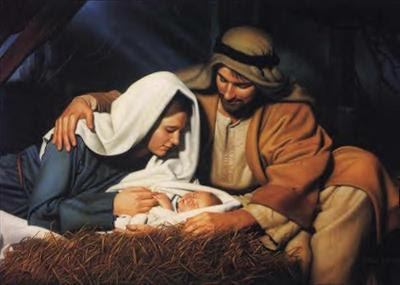 And remembering what Christmas is all about...the most important thing. Welcome to my parent's house! It may be big and open, but it is still a very warm and inviting space. My mom has a spritual theme throughout the house all year around and at Christmas time it really comes to life. Angels, crosses and even butterflies are all a part of her Christmas decor. This is the first time we have put this tree in the entryway. It is actually a tree I used to put up in the T.V./computer room at my house. I haven't put it up in a few years since there is a bookcase in it's spot now. It is done in all gold with angels, stars, nativities, crosses, and poinsettas. The dining room is very elegant and beautiful! This is the tree in the kitchen area. It is done in fruit, angels, crosses, doves, butterflies...etc. Everything has spiritual meaning. I love the colors in this tree! This is a beautiful dining area in the kitchen. During the day it has an awesome view! Love the angel by the sideboard. Oh look! There's one of my tassels. Hope you enjoyed the tour! I think that's the last of the decorating posts...Whew! It's been a good run! Only two more days...oh my! 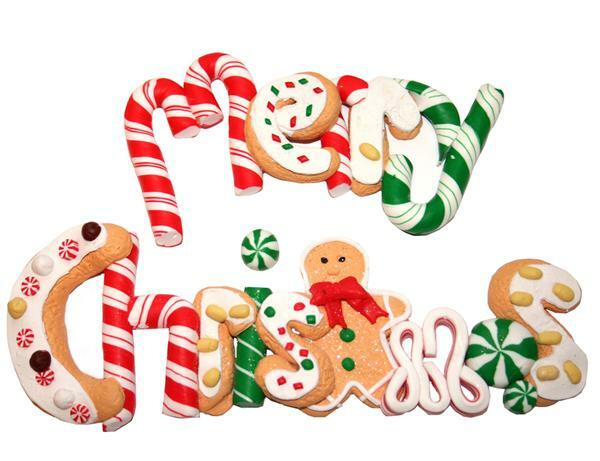 I hope you are all having a wonderful holiday season!! Welcome to Share Your Creations party #17! Boy, this week is flying by! Only 3 more days until Christmas! Are you ready?? I really enjoy looking through all of the links every week. I am always amazed by your talent!! 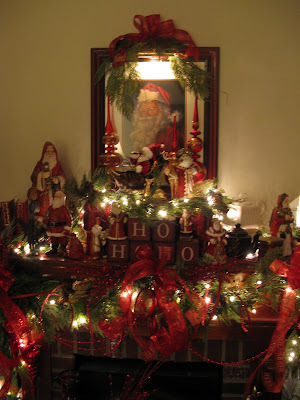 For this week's features I am focusing on Christmas again. What are we going to do when we have to take all of this pretty stuff down??? I'm already depressed...lol. Take a look at this fun and whimsical tree created by Suzi at Worthington Court. If you have not visited her blog you should. 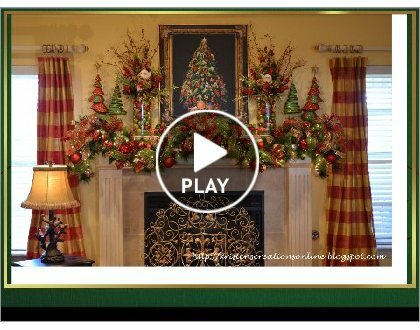 She has some wonderful Christmas decor! For a tutorial on how to make those wonderful cones visit The Project Queen. Love the way this sideboard is decorated! You all know how much I love peppermint and gingerbread decor! 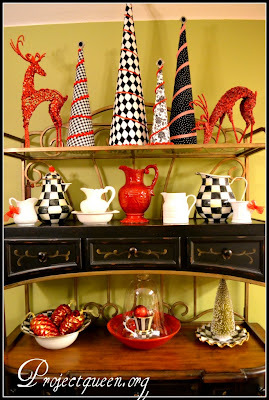 Visit Pinky at Designs by Pinky for more pics of her pretty Christmas decor. This tree is adorable for a little girl's room...look at the zebra tree skirt! Visit A Southern Sanctuary for more pics. I was going to show you my parent's house tonight, but decided to save that for Friday. One of my clients told me about Smilebox.com the other day. It's a site where you can put a slide show together with music. You can e-mail your slide show, post it on a blog, share it on facebook, or burn it onto a CD. It's a really neat site! I decided to mess around with it today and came up with a slide show of some of my Christmas creations of 2011. It includes my house and some of the houses I decorated this year. Just click PLAY to watch the slide show...you might want to visit Smilebox. com to make your own! I know you are all probably busy getting ready for the big day. If you have time I would love for you to link up! You can share an item you have created, a room you have decorated, a piece of furniture you have painted, a vignette, a recipe...the list goes on and on. You definitely know it's Christmas time when you step inside the front door! This pic is for L...I didn't realize you couldn't see the light up presents by the mantle. These lanterns got alot of attention on Pintrest. Love that site! There are so many great ideas and way too many wonderful recipes. I just bought the deer by the chair on sale for $12 the other day...couldn't pass that price up! I used the Christmas present piece on the mantle last year and decided to use it above the T.V. this year. This Santa in the hot air balloon is so much fun! Ha! 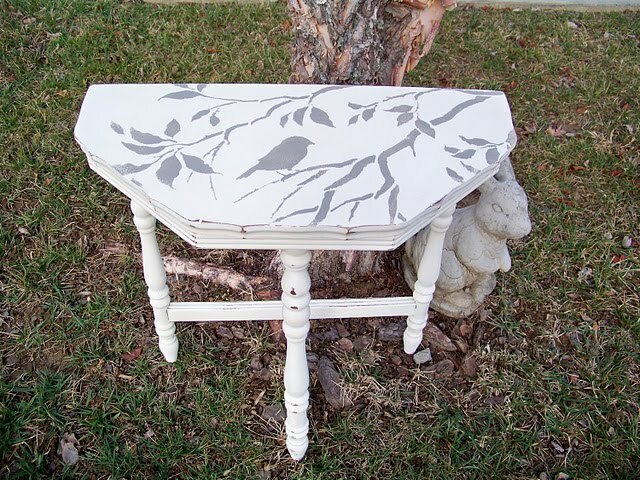 This piece is so whimsical! I know I just showed you the dining room last week, but thought I would take more pics for the tour. I don't see one present under that tree! I better get busy!! As you can see I decorated the tops of the lights. There is a closeup pic at the bottom of this post. You probably remember the peppermint candle holders, gingerbread tablescape and tree from a few weeks ago. At the last minute I decided to add a little Christmas on top of my cabinets. I sold all of my Christmas tassels this year. Here is a better pic of the bow and curly glitter sticks I added to the lights. Well, I think I've shown you everything in my house! I still have my front door to show you soon. Joining Kim for Wow Us Wednesdy at Savvy Southern Style and Sherry at No Minimalist Here.